Photographer: Lawrie and Company, G.W. 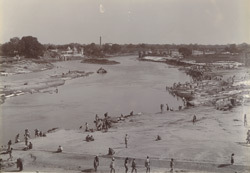 Photograph of the Gumti River at Lucknow in Uttar Pradesh, India, from the Macnabb Collection, taken by G.W. Lawrie and Company in the 1890s. Lucknow, the capital of Uttar Pradesh, was the home of the Nawabs of Avadh (Oudh) who ruled until the middle of the 19th century. Most of the architectural monuments of this peiod stand on the southern bank of the Gumti, which flows through the city. The Imperial Gazetteer of India records: “The two principal rivers [of Lucknow District] are the Gumti and Sai, and near these streams and their small tributaries the surface is broken by ravines, while the banks of the rivers are generally sandy. The Gumti enters the District from the north and after passing Lucknow city turns to the east and forms part of the boundary between Lucknow and Bara Banki. It is liable to sudden floods of great magnitude. Its chief tributary is the Behta, a small perennial stream rising- in Hardoi.” This photograph shows washer men on the riverbank, laundry laid out to dry and a railway bridge in the distance.